Aspen Camp is idyllically situated in the luscious green surroundings of Rishikesh. The city is not only famous for offering enthralling adventure sports but also for its temples and spiritual places. The camps welcomes the guests for an adventurous camping amidst the tempting beauty of the lush green surroundings and holy river Ganges. One can enjoy a variety of adventure sports which is done under the guidance of highly trained and efficient team of trip leaders, kayakers, safety marshals and mountaineers. 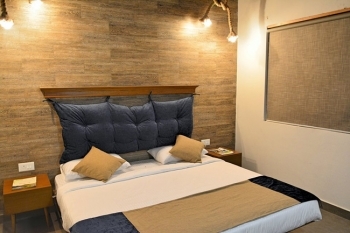 Offering luxurious accommodation in adventure capital with sports like Rafting, Jungle Safaris, Bungee Jumping, Aspen Adventure also has other campsite known as Camp 5 Elements in Rishikesh. 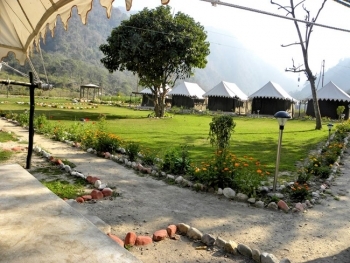 Aspen Camp in Rishikesh is situated on the foothills of the Himalayas. One can easily reach the camp site as it is located just just 09 kms ahead of Laxmanjhulla, Rishikesh in the buffer zone of the Rajaji National Forest on Neelkanth Temple Road. It is a perfect place to spent a splendid weekend as the camp is just 05 hours drive from New Delhi. Enjoy river rafting and other adventure sports like Bungee Jumping, Jungle Safaris, Treks and lotâ€™s more at Aspen Camp. You can await your stay at the Premier Swiss Tents and Luxurious Cottages which is well equipped with state of the art amenities. Have a comforatble stay at the 20 cosy Swiss tents and 06 luxurious cottages, sprawling over 06 acres, over looking a majestic river stream. The lively ambience of the camps and the welcoming atmosphere will entice you to visit this place again. Aspen believes that good food can open the door to your heart. A sumptuous buffet is served to the guests which boasts delectable Indian, Mughlai, Continental and Chinese cuisines. The mouth watering cuisines are hygienically prepared by an expert Ex-Hyatt Chef. The food is kept hot by using Skorr Wire Chafing Stands. The most happening thing about dining at Aspen is the Live Bar-be – Que around the campfire which makes the ambience lively. Camp Aspen is located just 09 kms ahead of Laxman Jhula, Rishikesh in the buffer zone of Rajaji National Forest. The travelers can easily reach the camp site as it is located just 05 hours drive from New Delhi, 90 minutes from the closest airport at Dehradun and 80 minutes from the nearest Railway Station at Haridwar. Trains are easily available at regular intervals such as Haridwar Mail from Delhi Cantt, Dehradun Express from Hazrat Nizamudin, Dehradun Shatabdi from New Delhi etc. The nearest airport is the Jolly Grant Airport at Dehradun which is located at a distance of 33 km.